Though she sang the night away at Cairo Opera House on Saturday, renowned Tunisian singer Ghalia Benali's work is not limited to the stage. In March, Benali released her debut collage-style graphic novel, a montage of classical oriental and modern norm-challenging motifs rich with calligraphy and illustrations. Ahram Online caught up with her for an exclusive interview about her latest singing trajectory and passion for storytelling. Ahram Online (AO): After publishing your first book Romeo and Laila a couple of month ago in Cairo, are you focusing on writing and painting your own books these days? 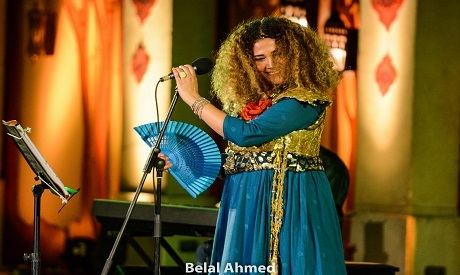 Ghalia Ben Ali (GB): In time, I realized that I am a story teller, I tell stories via songs, words, and costumes. I founded a publishing house of my own in order to produce this book. In Belgium they had a problem with classifying this book. Is it art? Story telling? Literature illustrated, big format? You see it was not only written in words. The illustrations themselves were a parallel story, a language of their own. It was translated into three languages. I even produced the music that goes with it. Currently I am thinking of how to produce a multimedia book. I am also thinking of producing set of cards that can make several forms of stories and each story is valid. AO: After the launch of your latest album Mawsoul (Connected), I feel you are more connected to young generations, chanting their Sufi lyrics much more than only revisiting Sufi classics? GB: I used to sing only classic Sufi lyrics because I used to believe that there is nothing new to be sung, all new Sufi lyrics were mere imitation of old Sufi ones to me. That is until I read consciousness-related poems (wegdani) written by young and young-at-heart poets whose work really touched me, for their words are our only salvation in this world. AO: During your more recent performances you recite poetry rather than sing it. Why? GB: True, after I finished my Paris concert, two days ago, the owner of the theatre asked me, do you often sing? (Laughs). I tell stories via music, because when I talk I don’t know which language to choose, so I choose the language of music. However, to me the poems are more important than the music, because the poem has its very own powerful internal musical world which is like a miracle to listen to. The idea that I go up the stage and improvise has become quite common these days. In my latest tour, how many musicians did I get introduced to on stage without knowing exactly what we were to perform? Indian, Armenian, German. For one hour its more of a hadra [than a scripted performance]. Hadra means presence, where everything is present and you are here only to pick up the vibes and connect.